Walking up to the door of the Starbucks in a neighboring town, I looked down to see a clearly marked footprint on the street. 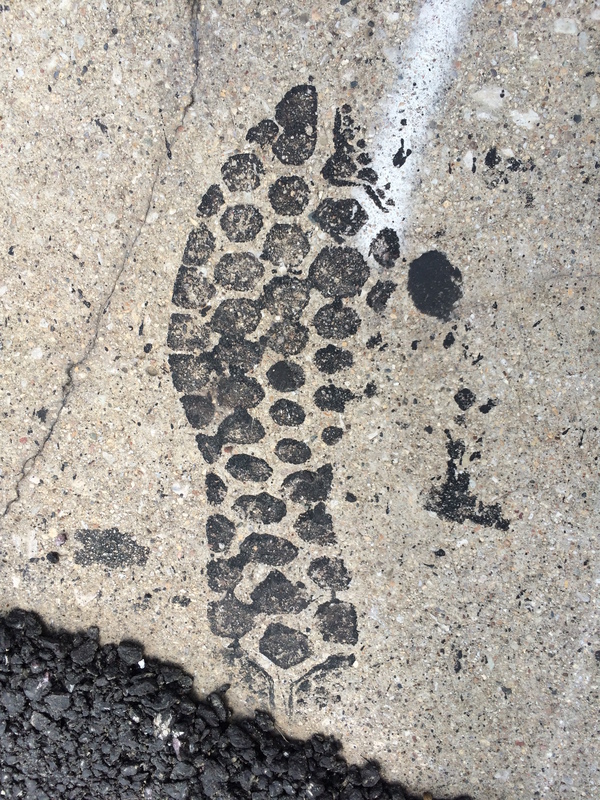 You don’t often see footprints made from tar on many streets. That’s a pretty remarkable fact given how many millions (perhaps billions) of tarsnakes are laid down by road maintenance crew on public roads and streets. It’s true: You just don’t see many footprints. That means the people doing the work of filling cracks with tar take quite a bit of care about their job, doesn’t it? You’d almost expect to see a million footprints all over the streets because the tar is so sloppy and easy to track arond. 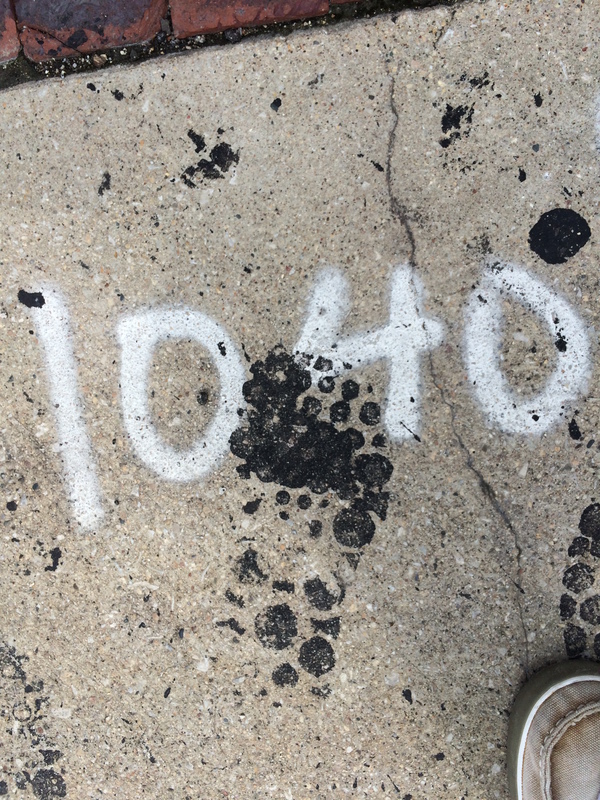 All it takes to begin making footprints is a single step into a freshly tarred crack in the road. Then your foot becomes a paintbrush. So we must give credit to those who do the work of sealing our roads so that they don’t fall apart at the seams. That’s what tarsnakes are for. They hold together the road in places where it cracks apart. 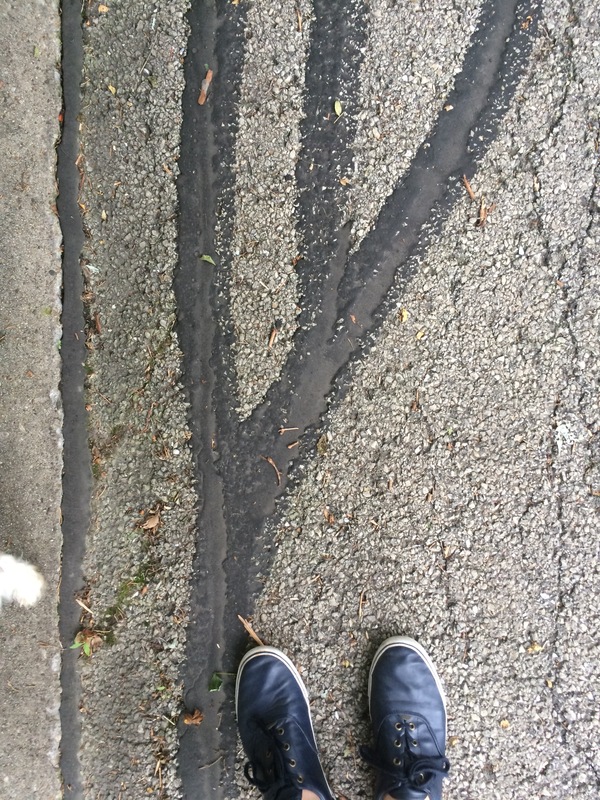 Otherwise water seeps through and degrades the road surface even more. In winter ice wedges down between the cracks and expands, further busting up the surface. That’s why you’ll typically notice more tarsnakes out along the road edges than out in the middle. Toward the edge of the road there is constant pressure from car and truck tires, plus the inevitable flow of water, ice, slush and salt to the side. Add in the pressure of loose gravel and uneven road edges and cracks are inevitable. 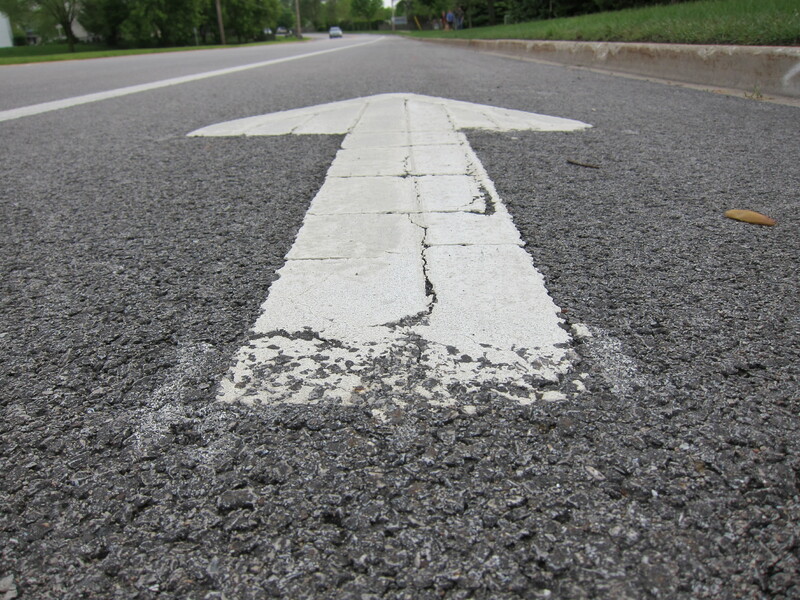 The constant battle against cracks in the road make maintenance a long running project. Tarsnakes also make riding along the side of the road an interesting proposition. 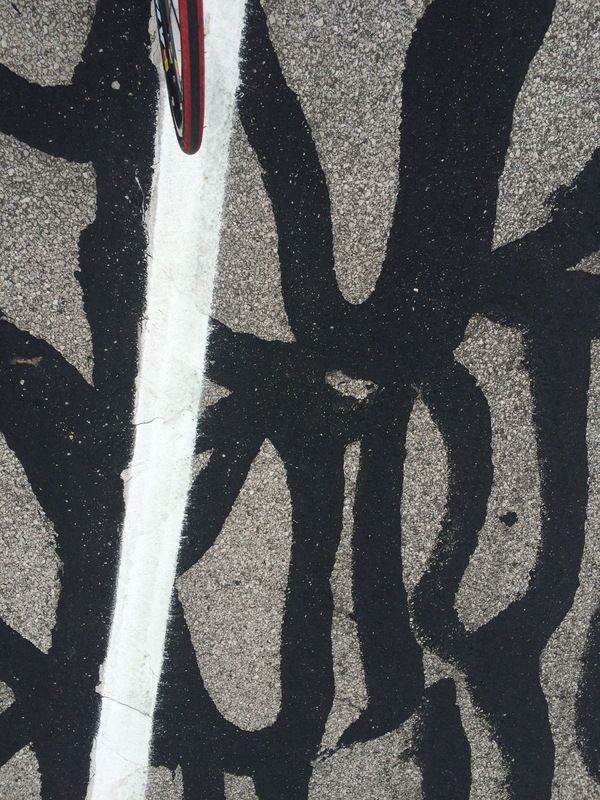 On hot days, tarsnakes sink down below the road grade when you ride over them. Your bike tire can get stuck in the rut and you wobble for a few moments. Some cyclists even go down in a heap. I know that feeling from experience. I once was told to cross the road laterally by a construction worker and within feet my bike tires sank into the fresh surface of the asphalt. You could hear the hissing sound of tar still burning and I worried that my tires would indeed pop. And what a mess that could be. I know a guy that tried running across a newly paved road and tripped. He got burns on his legs. So I pedaled like crazy to avoid having my tires pop and looked back to see that my tires had made thin impression through the tarmac. Talk about a reverse tarsnake! Every year the process of creating tarsnakes is the same. Workers armed with tar guns stroll the roads for miles, filling in cracks as they go. They walk along armed with black goo and do their best to follow the variegations of cracks in the road. You can imagine that must get rather tedious at some point. While watching the Tour de France this year I chuckled when an aerial view of the Tour riders on a country road in northern France showed the peloton crossing over an entire field of tarsnakes covering the road. It made me feel at home to know that the Tour encounters the same road conditions that we do back here in the states. Tarsnakes are not really noticeable to everyday motorists, so it is only cyclists and runners that really engage with this unnatural phenomenon. They are definitely a product of the human race. Or maybe its a mark of shame for those who lay tarsnakes to leave a footprint or two behind. There’s really no harm in that, but there are aesthetics to consider, and perhaps the road bosses dock your pay if you stomp around blindly leaving tracks behind. It makes you think about the impact of human beings in general, and the carbon footprints we generate every day of our lives. They may be invisible for the most part, but the tarsnakes of our existence really do make a mark upon the earth. This entry was posted in Tarsnakes and tagged carbon footprint, long tunning take on tarsnakes, road tarsnakes, running, tarsnake, tarsnakes. Bookmark the permalink.